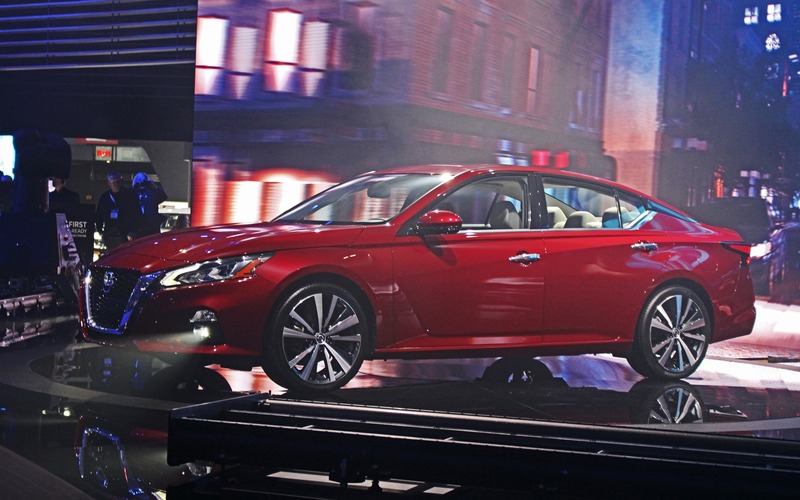 The Car GuideAuto ShowsNew York2019 Nissan Altima: This is It! 2019 Nissan Altima: This is It! NEW YORK CITY – Consumers may be flocking towards SUVs, but the good old midsize sedan isn’t ready to die anytime soon! We have proof with the latest iterations of the Honda Accord and Toyota Camry, two popular automobiles that have significantly transformed, completely changing our perception of what a sedan should be. Nissan believes it too can inject new life into its Altima. It’s not an easy task considering what it’s up against. While we’re pleased to hear the Altima will stay with us for a while still, how will this new 2019 model set itself apart from its rivals? In 2018, if you’re going to market a midsize sedan, it better be more than just a well-built machine. It has to impress, be desirable, cool and offer something the others don’t. Styling-wise, the new Altima is rather conservative. From some angles you’ll wonder if the car changed at all. But the overall appearance remains sportier than the car it replaces, with styling cues taken from the Maxima and the Murano. The car is in reality 2.7 cm lower and wider by 2.5 cm. The wheelbase was also stretched by 4.8 cm. The biggest and most important news is the addition of all-wheel drive. Remember, none of the Altima’s competitors, except the Subaru Legacy and Ford Fusion Sport, offer this option. And if you want my honest opinion, this is a fantastic idea, especially for Canada, where the car should sell well. Two engines will be offered, the first being a 2.5-litre four rated at 188 horsepower and 180 lb.-ft. of torque. All-wheel drive will only be offered with this engine. Higher-end Altima trims will come fitted with Nissan’s all-new 2.0-litre VC-Turbo engine. That’s the one with a variable compression ratio that was first introduced in the Infiniti QX50. Not only will this engine help the Altima save fuel, but also proves to be lighter and more compact than the now-defunct 3.5-litre V6. For the Altima, VC-Turbo pumps out 248 horsepower and 273 lb.-ft. of torque. Unfortunately, all-wheel drive will not be available with this engine, and the only available transmission for the entire Altima lineup will be Nissan’s Xtronic continuously variable automatic. Sadly, the manual gearbox is long gone. Like its competitors, the 2019 Nissan Altima will come with all the latest in driver assist technology, as well as Nissan’s ProPilot Assist semi-autonomous features. An all-new, massively updated NissanConnect infotainment interface and eight-inch touchscreen will also make their debut. The system will not only be Android Auto / Apple CarPlay compatible, but also pair well with Apple Watch and Android Wear. The 2019 Nissan Altima will arrive in dealerships this fall. Of course, we’ll have a chance to get some seat time in the car beforehand to share our driving impressions.